Kim is not a stupid woman. She is not the product of a severely abusive childhood. Kim is the girl next door or your daughter’s BFF. It’s impossible to discern, looking at this unpresupposing person, that she is a hard-core meth addict and a drug dealer of some stature, smoothly negotiating meth buys. She is a respected and financial force to be reckoned with in the under-world and can hold her own dealing with small or large time drug operators. 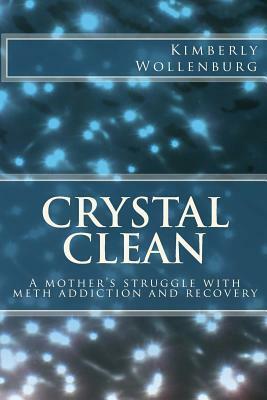 Kimberly Wollenburg unfolds the story of her growing addiction in her biographical memoir, “Crystal Clean,” laying bare her motivation as she gradually escalates into the active and upper echelon drug under-world of Idaho, introducing us to each successively flawed character in her drug oriented world with unerring descriptions of dealers and users in graphic detail. Kim is a single mother of a special needs son who becomes the driving force that helps her fight demons most of us cannot fathom. Separate from her beloved son, is it possible to hold a love interest based on the love of drugs rather than each other? Can you actually survive a highly elevated tolerance for such a devastatingly pervasive drug as meth and still triumph in a new life? “Crystal Clean” will have you on the edge; you must know if she can pull it off–one more time–and survive. Previous Previous post: Book Review – What Is So Hard About That? Next Next post: Just the Pits–Isn’t!